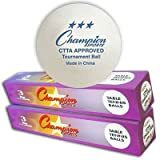 Play like a champion with the champion sports official tournament rated table tennis balls. The champion 3STAR ball is an official 40mm diameter, tournament rated, seamless, Chinese table tennis tournament approved ball. Sold in a pack of six balls.